Nethserver DNS primary and secondary server entries have mixed priorities in dnsmasq? My network has a router as default GW to the Internet, having address 10.0.1.1 - forwarding also DNS requests to the internet DNS servers of my ISP if the local DNS is down or cannot resolve the name. However I noticed that local names cannot be resolved as the DNS request seems not be forwarded to my local primary DNS server. systemd: Started DNS caching server..
# command line or the dnsmasq configuration file. I.e. the nameservers appear in different order here compared how they appear in the message log. As the “strict-order” option is set in the /etc/dnsmasq.conf file this could be important. 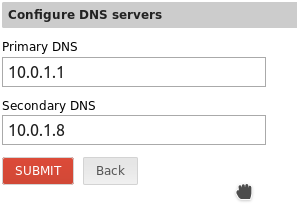 When I define the primary and secondary DNS servers mixed: i.e. Dec 28 22:39:11 server1 systemd: Started DNS caching server.. Here now the 10.0.1.8 server appears first in the logs as nameserver. home.lan. 604800  IN      NS      ns.home.lan. google.com. 44759   IN      NS      ns1.google.com. google.com. 44759   IN      NS      ns2.google.com. google.com. 44759   IN      NS      ns4.google.com. google.com. 44759   IN      NS      ns3.google.com. It clearly shows that the DNS lookup to the local server is now successful - so the local DNS server is queried first although it is configured as secondary DNS server in the NS7 config. Is this somehow a problem from dnsmasq or another issue? Maybe somebody knows? 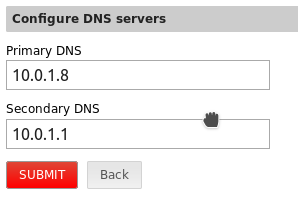 You are right, it seems that dnsmasq uses the last dns forwarder entry as primary one. Dec 29 06:55:28 server1b collectd: Exiting normally. Dec 29 06:55:28 server1b collectd: collectd: Stopping 5 read threads. Dec 29 06:55:28 server1b collectd: rrdtool plugin: Shutting down the queue thread. This may take a while. Dec 29 06:55:28 server1b collectd: ping plugin: Shutting down thread. Dec 29 06:55:28 server1b collectd: collectd: Stopping 5 write threads. Dec 29 06:55:28 server1b collectd: Initialization complete, entering read-loop. Dec 29 06:55:29 server1b dnsmasq: compile time options: IPv6 GNU-getopt DBus no-I18N DHCP TFTP "--bind-interfaces with SO_BINDTODEVICE"
As you can see the 10.0.1.8 primary DNS is appearing as the last entry in the syslog. So this seems to me as a regression issue in the dnsmasq service itself when dnsmasq is reading the entries from the dnsmasq.conf file (as the e-smith template expansion always put the primary DNS server as first server in the dnsmasq.conf file, correctly I would say). Compile time options IPv6 GNU-getopt DBus no-I18N DHCP TFTP "--bind-interfaces with SO_BINDTODEVICE"
Maybe at least that should be noted somewhere in the docs or in the NS7 GUI. I think I can confirm that dnsmasq behaviour changed in 7, but I can’t find a reference in the changelog. A quick inspection of the code didn’t reveal the change, either. That’s one reason why “strict-order” is broken and not recommended. @jrieder, to solve your problem you may try to explicitly tell dnsmasq to query your internal dns for internal host names. I have a long-standing feature request for a panel to configure these options. Since this is confirmed I took the liberty to change the topic from support to bug.